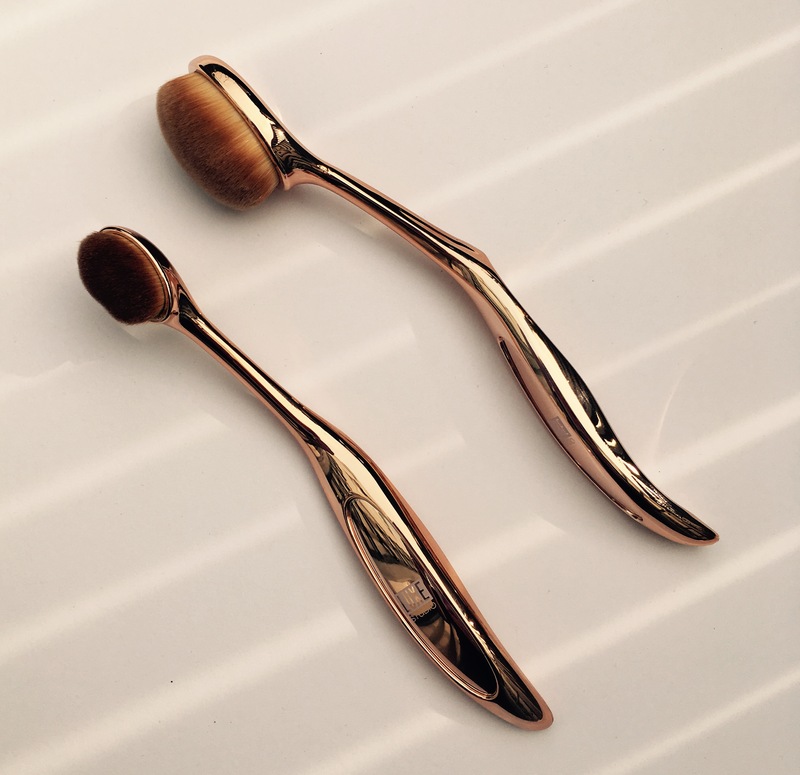 Let’s talk about oval makeup brushes. Why use them and what makes them different to the regular type? Surprisingly, the lovely oval shape is about the least interesting thing about these brushes. Their USP is that the bristles are incredibly densely packed, so you get a smooth, slightly domed surface that feels like velvet. Stroking it with your fingertips is really quite relaxing. I think I’ve found a new hobby. This denseness means that whatever product you’re applying stays on the surface of the brush. And if your brush is comprised of man made fibres, these are less porus than natural fibres. So an oval brush made of synthetic fibres will use up less product, especially liquids such as foundation or skincare. And look – up for examination today we just happen to have a pair of synthetic fibre oval makeup brushes. What a coinkydink, just when you thought I was making this up as I go along (to be fair, a lot of the time I am). 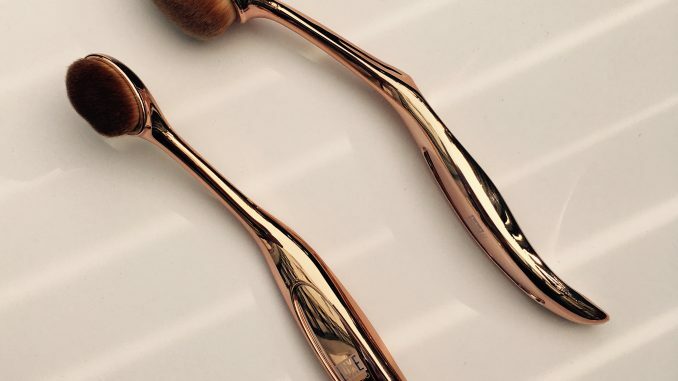 Luxe Studio Rose Gold Brushes are new in at Boots, and this two brush set is for face and eyes. The smaller brush is for blending eye shadow, or it could be used for applying highlighter or concealer. The larger one can be used for anything from skincare to sun cream to contouring. The long, angled handle makes it easy to work product around the face, although as application techniques go it does take some getting used to. But if you’ve used a beauty blender, it’s the same kind of buffing technique, only with a handle. Although they look metallic, with a rose gold finish, they’re actually made of plastic so they’re very lightweight. And they give a terrific finish – seamlessly even all over. If you find that your base make up is inclined to go streaky, then this (along with better skincare) will help a lot. The flattish surface means that most of the bristles are in contact with the skin at once, helping to make coverage more even. Some of the oval make up brushes around right now are eye-wateringly expensive, so Luxe Studio are a much more pocket friendly way to dip a toe in the trend, especially if you catch the current offer at Boots. The oval makeup brushes featured here are the Luxe Studio K1 2 piece oval brush set. RRP £18.99, available here at Boots. The Luxe Studio range is exclusively available online and in Boots stores, with prices ranging from £8.99 to £22.99. The brand is currently on a buy one, get the second one half price in Boots.